Milton Lake is 44 km S of the NWT border and 130 km NE of Stony Rapids. Outposts at Walker Lake, 11 km S of Milton Lake; and Misekumaw Lake, 100 km NE of Points North Landing. Open Jun 10 to Sep 9. ​Milton Lake Lodge is a fly-in fishing lodge in the far northeast corner of Saskatchewan with excellent fishing for northern pike, lake trout and Arctic grayling. Rods, reels, gear (including fly-fishing) and tackle are provided. A professional guide for every two guests with a 17-ft. Lund Outfitter boat will make fishing a comfortable adventure. The lodge accommodates groups of up to 16. Guests get private rooms with daily maid service, gourmet meals prepared by the lodge's chef, and access to two beautiful beaches, as well as canoeing and hiking opportunities. 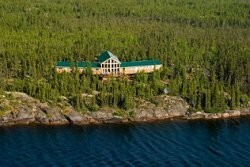 ​See Travel Offers or contact Milton Lake Lodge.